Sarnath’s ship arrives in Dimension X near a Black Hole. As Don explains to everyone what a Black Hole is, their craft is suddenly attacked by Ki’Rec and his Imperial Aerwyl Fleet. Sarnath fights back and a space dogfight ensues. Everyone puts on pressurized space suits in case they need to abandon ship. Sarnath does well dispatching the attackers, but his ship takes heavy damage and is eventually destroyed. 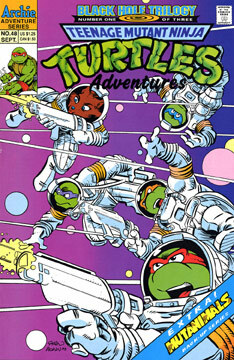 As the Turtles and Ninjara float in space, they see the wreckage of Sarnath’s ship being pulled towards the Black Hole. Mikey screams to their friend to eject, but Sarnath states that there’s no time to save both Qark and himself, and he jettisons an escape pod as his ship disappears into the Hole. The Turtles find themselves under attack from the remaining Imperials. Just as all seems lost, a strange ship arrives and destroys the attacking vessels. The pilot pulls alongside our heroes, explains that the ship belongs to the Nova Posse, and offers them a ride. Once on board, the TMNT met the rest of the Posse. The pilot is a gargoyle-like alien named Zebulon, who is accompanied by a humanoid woman named Trip, a blue woman named Luna Azul, a purple man named Rave and a four-armed bat-like woman named Exeen. Trip explains that the Black Hole they’ve just encountered didn’t exist in that spot a mere six months ago – in fact, there wasn’t even a star in that location that could have become a Black Hole. Donatello states that’s impossible, and the Posse explains that not only is it possible, it’s getting bigger and devouring everything in its path. The ship then comes upon Stump Asteroid, where a huge fleet of ships is circling (among them Cudley the Cowlick). The Posse land on the asteroid, where they’re greeted by Stump and Sling. Luna tells the materialistic duo that the Posse is at their service. Much to Luna’s surprise, Stump and Sling are far more excited to greet the Turtles and begin planning their next wrestling match. When the Turtles explain that they’re not interested and the Nova Posse has arrived to help assist them against the Imperial Forces, the wooden aliens couldn’t care less. Donatello excuses himself to go to the restroom. On his way, he encounters the Sons of Silence… and disappears.